Kentucky Governor Apologizes For Comments On Teachers' Strike : The Two-Way Gov. 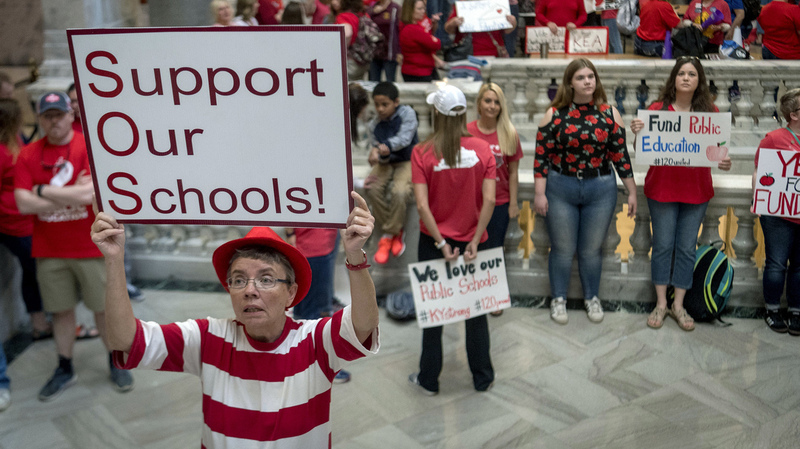 Matt Bevin's comments came as thousands of teachers protested at the state Capitol, asking lawmakers to override the governor's vetoes of bills that would increase public education funding. Teachers from across Kentucky gather outside the state Capitol to rally for increased funding for education on Friday, in Frankfort, Ky.
Kentucky Gov. Matt Bevin is apologizing for saying a teachers' strike left hundreds of thousands of children vulnerable to sexual assault and drug use. On Friday, Bevin told reporters, "I guarantee you somewhere in Kentucky today, a child was sexually assaulted that was left at home because there was nobody there to watch them." He also claimed to see people "hanging out" and "taking the day off" as teachers rallied at the state Capitol for increased education funding. "I'm offended that people so cavalierly, and so flippantly, disregarded what's truly best for children," Bevin said. Bevin's comments provoked anger and a rapid backlash from teachers' groups and state politicians. On Saturday, Kentucky's Republican-led House of Representatives approved resolutions condemning Bevin's comments. In a four-minute online video on Sunday, Bevin said his comments were misunderstood. "The words that people say can have unintended consequences," he said. "Many people have been confused or hurt, or just misunderstand what I was trying to communicate." He went on to apologize "for those who have been hurt by the things that were said ... it was not my intent." On Sunday Kentucky Gov. Matt Bevin released a video in which he apologized for comments he made on teachers' protests. Bevin's controversial comments Friday came as thousands of teachers demonstrated at the state Capitol in Frankfort, demanding that lawmakers override the governor's veto of key bills, including reforms to the tax code, and a $22 billion state budget with record new spending on public education, which teachers' groups say is crucial. The tax bill includes a 50-cent increase in the cigarette tax, and a 6 percent sales tax on some services such as home and auto repair. "In debates on their chamber floors, Republicans painted the tax bill as the only way to pay for the extra education funding they provided in the final budget, compared to more austere versions of the budget seen earlier in the session: fully funding teacher pensions, restoring funding for transportation to K-12 schools and raising the amount schools receive per student." Fifty-seven House Republicans, later joined by Senate Republicans, voted to override the governor's veto. More than 30 Kentucky school districts closed Friday for the rallies. Teachers also protested Bevin's plan to overhaul the state pension system, among the worst-funded in the nation. Bevin's pension-reform bill, which he signed on Tuesday, requires new teachers to enter a cash-balance plan, and not a traditional pension. Teachers groups say these changes to the pension system could discourage people from pursuing a career in education. In West Virginia, a nine-day walkout led to a 5 percent pay raise for teachers. Arizona's Gov. Doug Ducey recently promised a net 20 percent raise by 2020 after weeks of teacher protests and walkout threats. Last week in Oklahoma, teachers ended two weeks of walkouts, and are focusing on electing pro-education candidates this November.